"Pickle's Washington Report," the newsletter of Texas Congressman Jake Pickle. 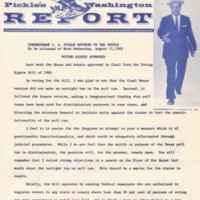 "Pickle's Washington Report" chronicles Texas Congressman Jake Pickle's backing of the Voting Rights Act. His support was tempered by his belief that the poll tax issue should be decided by the states rather than the federal government. 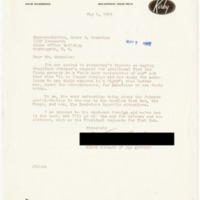 Letter from Vice President Hubert H. Humphrey to Texas Congressman Jack Brooks. 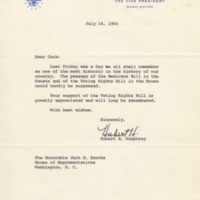 Vice President Hubert H. Humphrey expresses gratitude to Texas Congressman Jack Brooks for his support of the Voting Rights Act of 1965.